August 2014 by Covenant Communications, Inc.
"It shall be the son, the firstborn in the new monarchy, who shall quiet the fears and unite the nation again." The infamous prophecy declaring that the firstborn would be a boy is the last thing Sarah wants to deal with. As if being newly engaged isn’t difficult enough, she’s still coming to terms with the fact that the first eighteen years of her life were a farce. The prophecy—the reason she had been secreted away from her family and her royal heritage to begin with—wasn’t supposed to disrupt her life any more than it previously had. But when unexpected events force her to leave her fiancé, Prince Alexander, Sarah must return to her home country of Kyrnidan to face her destiny. Reunited with her royal family, Sarah is thrust into the political turmoil that surrounds her ancestral home. To make things worse, her arrival has upturned the long-held prophecy. As the voices of distension mount against her, Sarah turns to her bodyguard, Luther, for protection. But Luther’s protection comes with a price. Propelled into a plot that threatens her life and the welfare of the entire kingdom, Sarah must determine where her love and loyalty truly lie. Torn between two men, she will now have to face her fears and undertake a journey of self-discovery that will change the fate of a nation…. 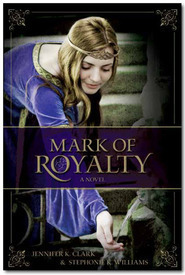 Mark of Royalty is the book previous to this. Although Bonds of Loyalty is the continuation of Sarah's story it is a stand alone book. Bonds of Loyalty continued to intrigue me with its political unrest, feel of danger, and light romance. I was a little worried about Sarah and if she would stay loyal to Alex as there is a second love interest introduced. I was also unsure if Luther's loyalties were where they should be and if his motives were true. It was easy to see where there could be plots and conspiracies behind several of the characters actions, which meant not knowing who Sarah could actually trust. There was a lot going on in this story. You have a daughter and princess, Sarah, who is reunited with her parents and country of birth who has never known either in her eighteen years. You have a loving brother, heir to the throne even though he is not the firstborn. You have a prince left back in another kingdom, the kingdom she had called her own her whole life, waiting to be able to wed Sarah, and a guard who is also vying for her affections. You have jealous and power-seeking ladies and lords of both courts. Then you have individuals who want to harm Sarah and even these kingdoms. It was interesting to see it all play out, to see how Sarah would handle it all, and to find out what choices she would make. I continued to like all these characters. I did want Sarah to more fully step into her role and act like the princess she was, but I could also see the difficulty of her position. There was just quite a bit of drama. I thought Luther was fun and protective and sweet at parts, but I wanted Sarah to stay loyal to Alex and to let him back into her heart. I'm not a huge fan of love triangles, so that wasn't my favorite part of the story, but I could see how it drove the plot. 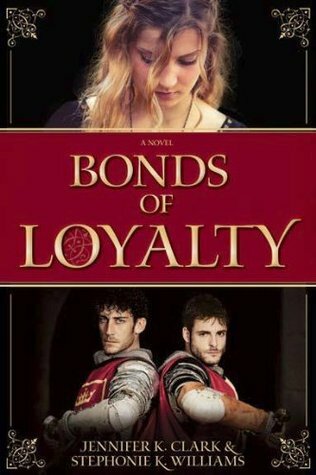 Overall, Bonds of Loyalty was another enjoyable book from this series. I enjoyed this one more, in some ways, than the first book. The pacing was better for me and I didn't feel that the story slowed down as much and was more consistent in some ways. If you enjoyed the first book, Mark of Royalty, or historical romance then I would recommend this series. I'm looking forward to reading more from these authors! Sounds like a solid historical romance. I haven't seen this series before, but I am going to go look it up. Thanks for the recommendation, Tressa. Great review. My sister loves these romances, I'll have to recommend it to her. I've seen this book around the internet this week. It does interest me. I hope you enjoy it when you get a chance to read it! I love SF too! This one is on my tbr. Lol! Well, I know that everyone reacts to covers differently. Thanks for stopping by! I have enjoyed this series so far. I hope you do to when you grab a copy! I hope she really likes the series!